Chemistry class was always a favorite of min -- the tubes, beakers and flasks, the interesting experiments. 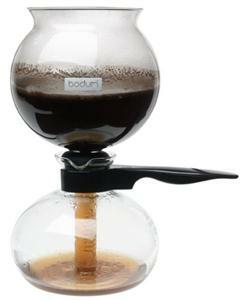 I guess that's why I'm drawn to this unusual coffee making system by Bodum. Each time a pot is made, it's like a little laboratory in my kitchen. It is as much fun to watch as it is to prepare. Suddenly, shlepping to the kitchen to make a cup is no longer a chore. When you heat the water, it boils into the upper chamber and joins the grounds. After the brewing is complete, the coffee flows through the filter and back into the lower chamber for serving. It creates several delicious cups per pot with no sediment. The Santos is more than just a curvy beauty; people who use it believe it better preserves the oils of the beans and say it produces a superior cup of coffee. The temperature of the finished cup is hot, maintained even with a generous addition of cream. Forget those unsightly, stained, mediocre plastic beasts. If you are one of those people who appreciates items like a good burr grinder, who wouldn't think of parting with your French press, this might be the next great leap forward in your coffee enjoyment. Also see this stovetop coffee & espresso maker by Alessi.